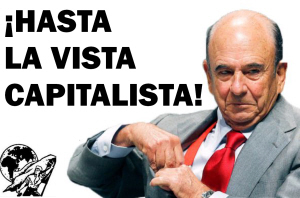 We strongly condemn what we consider to be the terrorist acts of the Santander group, such as the semi-slave working conditions of thousands of workers not recognized by Isban, the selling of junk bonds and mortgages, investment in arms, tax evasion, etc. These practices have ultimately ended in the death of a decrepid old man of 79 who bore the "burden" of being the most powerful man in Spain and powerful abroad. All the riches in the world could not prevent him from landing up in the grave at some point. We again demand that the business group and its recently appointed new management stop its exploiting activities. We hope that the day of action tomorrow, Sept. 11, will force them to meet our demands. Long live anarchosyndicalism! Death to the State and Capital!